Christel R. Cooper, 97, of Sparta, was born into Heaven on Friday, August 24, 2018. She was born August 15, 1921 to the late Reinhold and Gertrude (Steinstrom) Wittig in Stettein, Germany. Christel immigrated to the US in 1926. She graduated from Logan High School. Christel married Lyle A. Cooper in June of 1945 in a double wedding ceremony with her sister, Rose Marie (George) Brady. 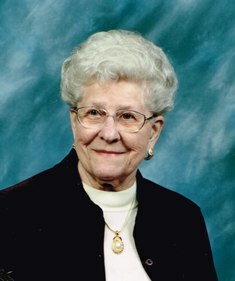 Lyle preceded her in death in 1995. She worked in the Audio Visual Department for Ft. McCoy until her retirement. Christel enjoyed golfing, dining, and dancing with her husband and friends. We know you are all dancing now in Heaven. Christel is survived by her two daughters, Jeannie (Harry) Borgman, of Marshfield; and Linda (Joe) Jacques, of Sparta; a son, Jerry Cooper, of Warrens; her brother, Ed (Elsie) Wittig, of Cedar Rapids, IA; her grandchildren: Scott (Nyki) Borgman, Kristie (Christopher Nonn) Borgman, Mike (Shawnda) Jacques, Wendy (Bill) Bates, and Stacey (Travis) Wittmerhaus. She is further survived by nine great-grandchildren; two great-great-grandchildren; and several nieces and nephews. In addition to her husband, Lyle and parents, Reinhold and Gertrude, she was preceded in death by a sister, Rose Marie Brady; a grandson, Joseph Cooper; and great-grandson, Cameron Borgman. Christel’s family wishes to extend a heartfelt thank you to: Nan Olson, for your caring attendance to our mother during her stay at Homestead and BridgePath. Luanne Thorson and the 1st floor staff at BridgePath for the special care you gave our mother; she was happy to be spoiled by all of you. Emily at hospice for your caring assistance and to Angie Wall for the care you gave to our mother and the sensitivity to our needs is overwhelming. You and Luanne went above and beyond your assigned duties as caregivers to our mother. We were so blessed to have you all and you will forever be in our hearts. Thank you. In lieu of flowers, any memorials may be given to the Morrow Memorial Home or a charity of your choosing in Christel’s name.